when not writing books about Irish history or cooking gourmet feasts for guests such as me and Zsofi (8 – she insisted on coming to Ireland). You may have noticed that County Antrim is not exactly in Scotland, which is the fraud Hector perpetrated on me in response to the one I tried to pull on him. In a desperate ploy for recognition the Underwater Piano Shop offers free tuning in the Highlands and Islands, as long as you put me up under the piano, and Hector is the only one who’s taken me up on it. When I mentioned that even an American knows that Ireland is not in the Highlands he offered to pay my ferry from Cairnryan. 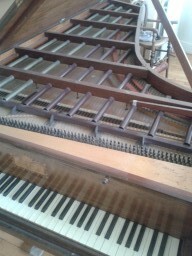 He said he has several pianos needing tuning. It was then that I mentioned that only the first tuning is free, subsequent ones are charged at my normal £55. But by then I had him and vice versa. It was almost a full tone low. Those tubes – forerunner of the modern cast iron plate – are of one metal for the bass and another for the tenor and treble. The piano was strung 30 years ago and has that primal plate so I saw no reason not to bring it up to pitch but it seems like a valuable piece which I would hate to destroy in an explosion due to adding tons of tension. So I very gingerly brought it up seven beats to about 3/4 tone low. Nothing broke. However, antique tuning pins have no hole for the wire and several started slipping under tension. That was the first night. In the morning after a full Irish breakfast for me and Zsofi and Hector and his labradoodle Coco I brought it up another quarter tone to exactly half a tone low. 415hz may have been the original pitch because the treble suddenly came alive. But the slippage at the tuning pins was frustrating. In desperation I dribbled superglue on the coils and presto they tightened right up. Then we all went over to Hector’s friend Ms. English’s house and spent the night there by the lovely seashore next to an old church she and Hector were trying to save from the wrecking ball by holding a Saturday book fair there. Complete with raffle which Zsofi won. Lots more gourmet eating. Antrim is magical. We saw a leprechaun’s house in Ms. English’s forest. Sunday morning it was time to leave (6:30) after a final midnight tuning and some predawn damper regulation. The other pianos will have to await our return. We had enough tuning and eating for one visit. This entry was posted in Blog on March 29, 2015 by tunerben.